The expectations one has for watching a taping of a theatrical play will likely vary from person to person, hinged on how they interpret the statement: "It's as if I were actually there". Does that mean the camera stays predominately static, as if they're an audience member who remains in their seat and has a clear, unbiased view of the stage? Or, does that mean that the point-of-view closely moves with the actors and concentrates on the nuances of their performances, enhancing the cinematic tempo by zooming in and revealing character details that might not be so readily visible during a stage performance? Other productions have attempted to blur the lines of cinema and authentic theatricality with handcrafted recordings tailored for media -- take Kenneth Branagh's wonderful hybrid version of Hamlet -- but they often find themselves tilting to one side or the other, either as too much movie or too much theater. Julie Taymor's screened rendition of A Midsummer Night's Dream is a game-changer in that regard, crafting visual allure and dramatic intimacy without sacrificing stage presence. Taylor's run with A Midsummer Night's Dream lasted from October of 2013 to January of 2014 at Brooklyn's Theatre for a New Audience, utilizing a spacious yet intimate layout for the stage while retelling William Shakespeare's classic comedy of meddlesome spirits, young love, and a play-within-a-play. Hermia (Lilly Englert) has fallen in love with Lysander (Jake Horowitz), yet her father, Lord Egeus (Robert Langdon Lloyd), wishes for her to marry Demetrius (Zach Appelman); Helena (Mandi Masden), meanwhile, yearns for Demetrius. The complexities of their amorous affairs lead them to flee into the forest, to which they enter the domain of the fairies, especially that of Puck (Kathryn Hunter), servant to fairy-kind Oberon. Impishly, Puck contorts the desires of the young lovers, while also messing with the mentalities of workers in the midst of crafting a play for the stately wedding of Egeus and Hippolyta (Okwui Okpokwasili) … as well as with the headspace of Titania, Oberon's estranged queen. What ensues is a night of chaos, passion, and mischief that approaches realizations for all involved, while obscuring the line between reality and fantasy. Those who have seen Julie Taymor's cinematic endeavors -- her award-winning biography Frida, her Beatles-driven homage Across the Universe, her prior Shakespearean efforts with Titus and The Tempest -- know that the language, inventiveness, and enthrallment of visuals are of chief importance to her. This transitions exceptionally well to her stage performance of A Midsummer's Night Dream: the costume designs for the fairy hierarchy reminds one of that textured, ornate, yet still sparse and effortless detailing from her Shakespeare films, though the enrapturement of the setting doesn't kick into gear until the characters venture into the woodlands. Once there, Taymor utilizes strategic lighting and the motion of those bamboo shoots, sometimes bathed in blue light and other times touched with almost-blacklight vivid greens and purples, to create a surprisingly alive, spellbinding setting. 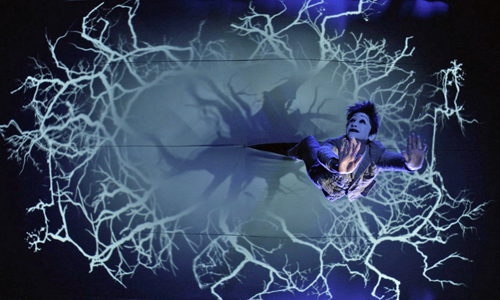 Both subtle and attention-drawing, the realignment and levitation of the woodland plays a pivotal role in the immersive properties of Taymor's environment. In tone, tempo, and sporadic happenings, this A Midsummer Night's Dream evokes an attitude somewhat reminiscent of what a Cirque du Soleil performance of Shakespeare's comedy might look like without the circus-style feats of strength and agility, an infusion of modern and whimsical flourishes. Fittingly, Puck fills the role of a jesterly assistant to the forest's ringleader -- fairy king Oberon -- as the character prances between surreal imagery of sleeping spells, pillow fights, and prancing deer, embodied by Kathryn Hunter's entirely ambiguous and quirkily distinctive face-painted performance, one that'd fit in with the broadly animated characterizations of silent-era cinema. She bridges the gaps between such scenes involving subtle choreography of en pointe ballet dancers creating wilderness animals and an animatronic head bringing to life a donkey-human hybrid, elevating the fanciful nature of Shakespeare's gradient of love's turmoil with charismatic puppet-masters pulling the strings. The intentions of A Midsummer Night's Dream hinge on both comedy and romanticism, but only one side of that emotional spectrum resonates in Julie Taymor's production, and it might not be the one you'd expect. Taymor directs her cast to telegraph their lines with fluid, almost contemporary comedic timing and staging, and their collective performances form into an updated, articulate, and genuinely humorous depiction of Shakespeare's zaniness, particularly underscored by Max Casella as the enthusiastic driving force behind the play-within-a-play's troupe of performers. While the rest of the cast members execute their characters with grace and power -- David Harewood is magnificent as a simmering, restrained Oberon; Tina Benko is a majestic Titania underneath her twisted blue dress and the small individual lamps shining on her face -- the dynamics of romance and sensuality are undermined by the younger cast members' lack of intimate chemistry with one another. Luckily, the fiery arguments that eventually erupt between them are another story, emphasizing where their rapport truly excels (and should ultimately excel), amplifying the foolhardiness of their affections in brave, funny clashes. 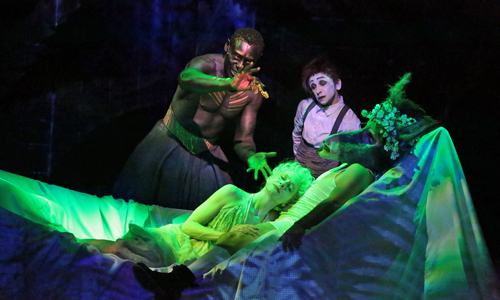 Shot by Oscar-nominated cinematographer Rodrigo Prieto and further scored by Oscar-winning composer Elliot Goldenthal, this taping of A Midsummer Night's Dream was specifically tailored by director Julie Taymor to accentuate her play's many strengths, which includes closely following actors as they move about the stage. Something unique and noteworthy occurs in the synergy created by the quality of the performances, the vivid production design, and the specificity of the camera's framing and focus upon the actors: Taymor gets her theatrical presentation to feel natural and movielike without deliberately avoiding the constraints of the stage and the often-embellished projection of the actors. Duller stretches in the two-and-a-half-hour span can only be helped so much by this; coupled with overtly "industrial" costume and set decoration, the scenes involving the craftsmanship of the play-within-a-play feel detached and lethargic against the ethereal happenings. Regardless, Taymor's custom recording of her Midsummer Night's Dream goes beyond making the audience feel like they're there.